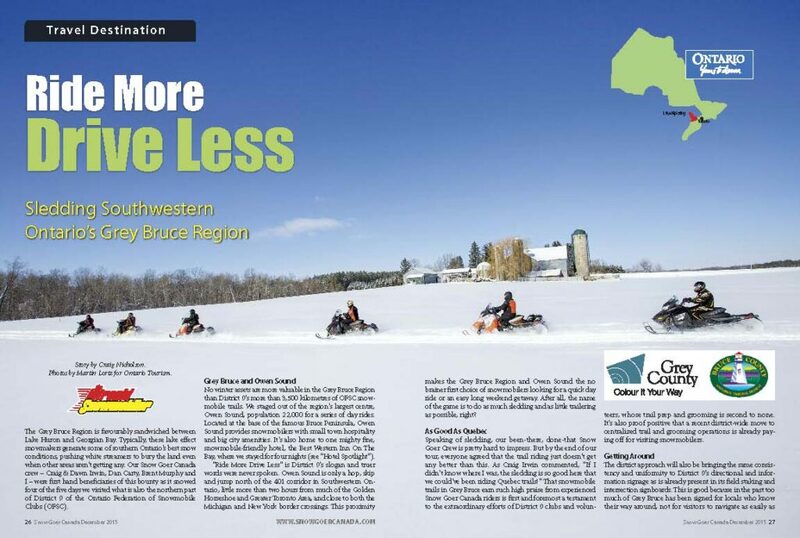 There are many reasons you should snowmobile Grey Bruce loops for your next Ontario snowmobile tour vacation. The Grey Bruce area is favourably sandwiched between Lake Huron and Georgian Bay. For snowmobilers, these lake effect snowmakers generate some of southern Ontario’s best snow conditions. They push white streamers to bury the land even when other areas aren’t getting any. Our snowmobile magazine crew of Craig & Dawn Irwin, Dan Carty, Brent Murphy and I benefitted from this bounty. It snowed four of the five days we visited what’s now called the Midwestern Ontario Region. 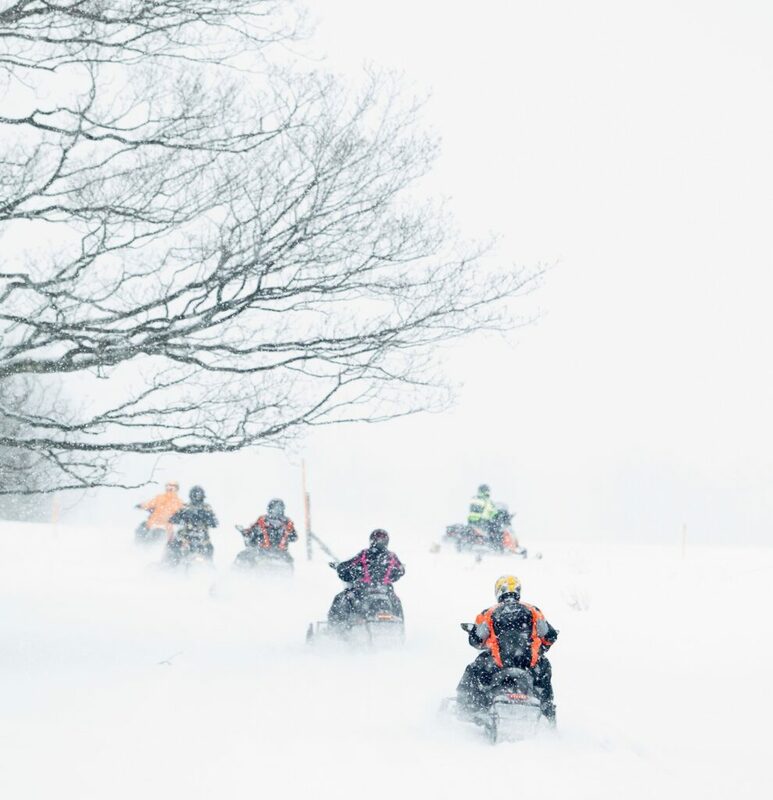 It’s part of the Ontario Federation of Snowmobile Clubs (OFSC) and the tourism region Grey Bruce Simcoe. See the snowmobile video below. Meanwhile, if you’re interested in other Ontario snowmobile tour destinations, check out the rest of my Ontario ride articles. The Grey Bruce area includes Grey County and Bruce County. 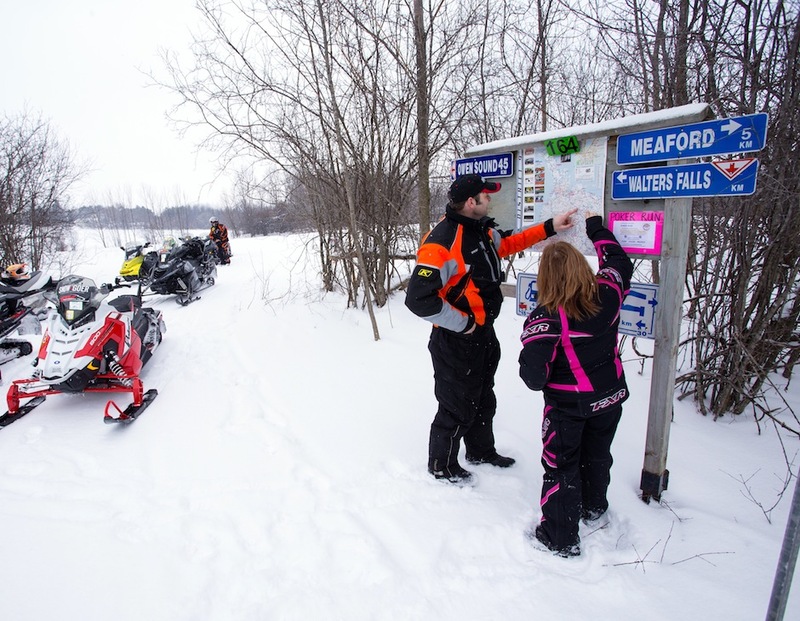 They have many assets – and none are more important in winter than their more than 3,500 kilometres of OFSC snowmobile trails. 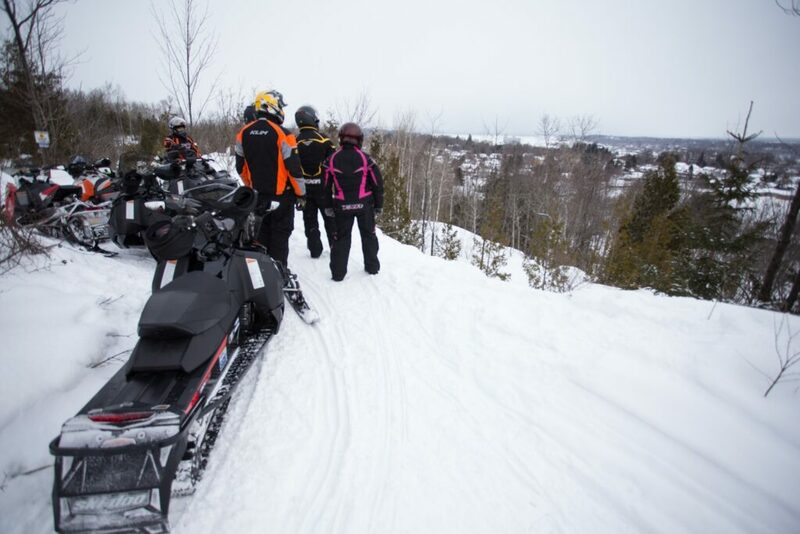 We staged out of the region’s largest centre, Owen Sound (population 22,000) for our Ontario snowmobile tour. Located at the base of the famous Bruce Peninsula, Owen Sound provides snowmobilers with small town hospitality and big city amenities. It’s also home to one mighty fine, snowmobile-friendly hotel, the Best Western Inn On The Bay. We stayed there for four nights while doing day loops (see “Hotel Spotlight”). “Ride More Drive Less” is the Midwestern Ontario Region’s slogan. Truer words were never spoken. Owen Sound is only a hop, skip and jump north of the 401 corridor in Southwestern Ontario. It’s little more than two hours from much of the Golden Horseshoe and Greater Toronto Area. The region is also close to both the Michigan and New York border crossings. This proximity makes the Grey Bruce and Owen Sound the no brainer first choice of snowmobilers looking for a quick day ride, an easy long weekend getaway or a great Ontario snowmobile tour. After all, the name of the game is to do as much snowmobiling and as little trailering as possible, right? Speaking of sledding, our been-there, done-that snowmobile magazine crew is pretty hard to impress. But by the end of this Ontario snowmobile tour, everyone agreed that the trail riding just doesn’t get any better than this. As Craig Irwin commented, “If I didn’t know where I was, the sledding is so good here that we could’ve been riding Quebec trails!” Snowmobile trails in Grey Bruce earning such high praise is first and foremost a testament to the extraordinary efforts of local clubs and volunteers. Their trail prep and grooming is second to none. It’s also proof positive that a recent district-wide shift to centralized trail and grooming operations continues to pay off for visiting snowmobilers. The district approach is also bringing the same consistency and uniformity to Midwestern Ontario’s directional and information signage. That includes its well-done field staking and many intersection signboards. Too much of the Grey Bruce was signed for locals who know their way around, not for visitors to navigate as easily as possible. One particular aggravation for us was uncertainty about how far and in what direction to go in places where road running is the only connection between two sections of trail. Some were well marked. Others less so, even though most roads are helpfully named on the trail map. I also had to re-orient my own trail navigation approach somewhat on this Ontario snowmobile tour. In Midwestern Ontario, they have numbered only the TOP (Trans Ontario Provincial) Trails on the district map and on the snow. This leaves a whack of club trails with no numbers. However, all intersections show with numbers on the map (but not 100% on the snow). So I had to learn to find my way from intersection to intersection by their numbers, relying less on trail numbers. It seems to me that the best system would be to have both intersection and trail numbers. But it’s not a perfect world. Trail distances on the map would also be a big help to newcomers that have no sense of distance perspective. I’d also appreciate more signage for gas stations. All that being said, Midwestern Ontario signage is a massive undertaking. The majority of OFSC snowmobile trails are on private farmland. That’s why club volunteers have to take down most of the thousands of trail signs and many more thousands of field stakes at the end of each season. And put them up all over again the next fall. What a job! But when you’re grinning from ear to ear while riding hour after hour on primo trails, signage is a secondary consideration. 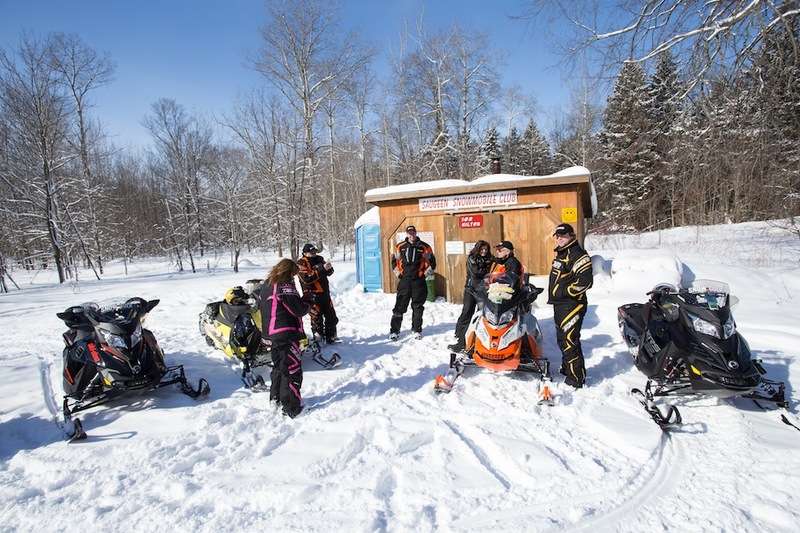 The Grey Bruce provides so many exceptional snowmobile trail options that connect so many communities that you’re never very far from services and amenities. In fact, one of the pleasures of Grey Bruce snowmobiling is the feeling of being off in the middle of nowhere while you’re really close to everything. Small towns, crossroads villages, farm homesteads and concession roads abound. So unlike many other destinations, assistance is always nearby if needed. So what’s the trail riding like in Grey Bruce? It’s an amazing diversity. The region’s prominent geographical feature is the Niagara Escarpment. It slices through the area and forms the backbone of the Bruce Peninsula. This escarpment provides several scenic lookouts like Skinner’s Bluff (just east of Intersection 45 off TOP Trail B107) and the one over Owen Sound (just east of TOP Trail B at Intersection 109). Plus the gorgeous Walter’s Falls (just west of Intersection 170). The beautiful trails through the Peninsula tend to be tighter overall than elsewhere in Midwestern Ontario. The many bush trails lend themselves to a more casual, leisurely ride, like we did on Day One. 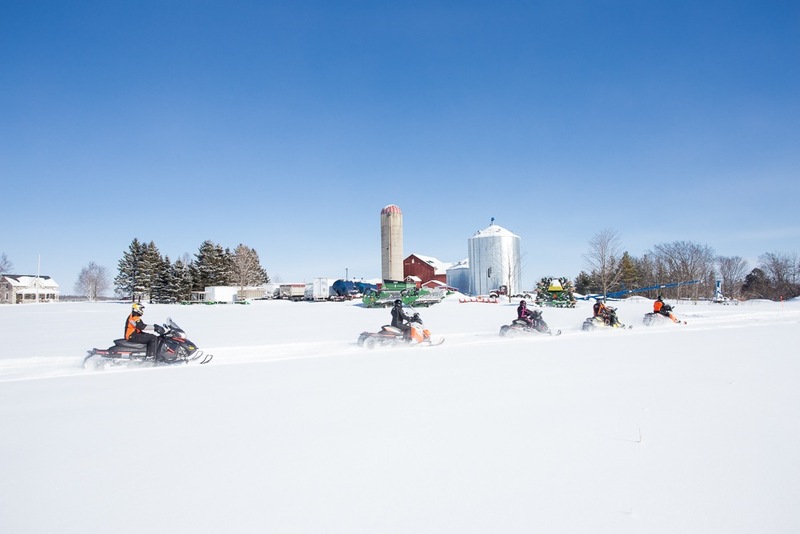 Alternatively as we discovered on Day Two and Three, riding south from Owen Sound, there’s plenty of wide open sledding across rolling farmland that never seems to end. It’s interspersed with many islands of bush, back-forty river valleys and long winding curves to keep things even more entertaining. The Grey Bruce also has its fair share of unopened road allowances and abandoned rail lines to zip up your ride. All in all, there’s something for everyone. Plus, there’s always the opportunity to extend or shorten your journey depending on who is riding and how your day is going. What’s more, the trail system is almost entirely land-based, so no ice to cross! Yes, you can rack up big miles in Grey Bruce if that’s your preference. But it’s not unusual to ride Grey Bruce in fresh powder on top of a hard packed trail as we did for three days. Then too, that lake effect weather can change in the blink of an eye. So suddenly you’re sledding through blizzard-like conditions with blowing snow, white outs and snowdrifts to enhance your adventure. That’s why the field stakes are so important and so ubiquitous throughout the region. Stakes also serve another equally important purpose for club. They remind riders to stay on the trail, because wandering off onto farmland is a sure fire way to annoy landowners and lose trail permission. Midwestern Ontario has launched several new OFSC Snow Tours. They have officially designated, mapped and marked them as loops to ride in Grey Bruce. Check out the Apres Harvest, Huron Gateway, Queen’s Bush, Saugeen River and Walters Falls Tours! Best Western Inn On The Bay. (519) 371-9200. It’s always a treat at the end of a hard day of sledding by kicking back at a great hotel. So if you’re looking for a seriously comfortable home away from home the full service Best Western Inn On The Bay is without a doubt the best place for snowmobilers to stay over and stage from in Owen Sound. Maybe that’s because the manager, Jason Hemstock, is such an avid snowmobiler himself! 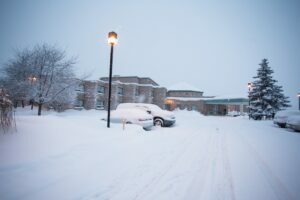 The very snowmobile-friendly hotel locates itself conveniently just north of downtown Owen Sound on east side of the bay. There’s ample trailer parking on its east side and direct access by local trail (turn at Intersection Marker 144) off of TOP Trail B on the east side of town. It provides excellent beds and facilities. Not one, but two hot tubs and a sauna ease those end of ride aches. And security cameras overlook sled parking. Meanwhile, the licensed on site restaurant provides absolutely scrumptious dinners and includes a hearty hot breakfast with your room. You can access fuel and convenience store at intersection marker 143, just down TOP Trail B from the Best Western Inn On The Bay turn off.